Thai Star Packaging Award 2016 has been organized by Department of Industrial Promotion (Industrial Development in Packaging and Printing Section), Thai Packaging Association, Thai Corrugated Packaging Association, and GS1 Thailand of The Federation of Thai Industries. 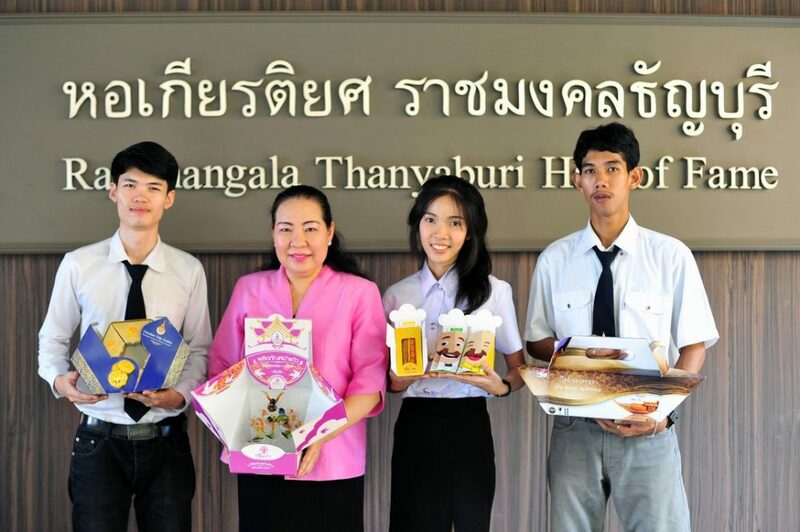 The topic of this contest was “Thai Identity towards AEC”. 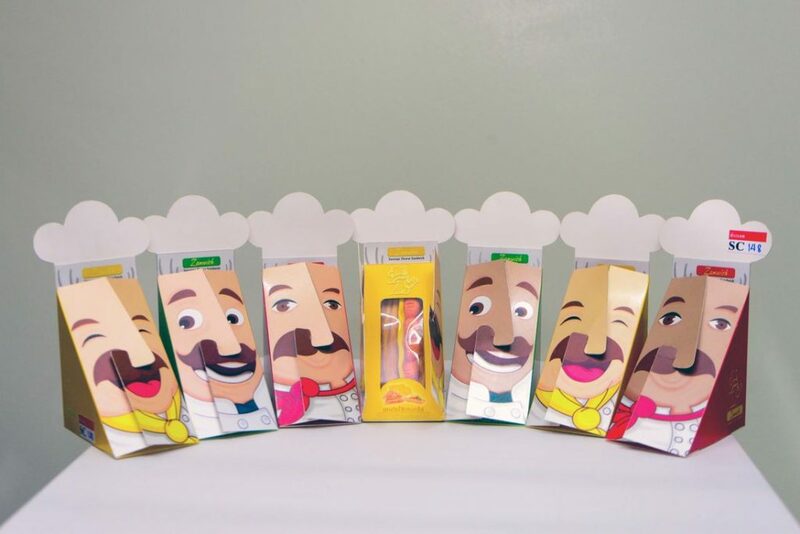 The main objective was to seek for the best domestic packaging prototype to compete in international competition and also encourage packaging designer to use their knowledge, skills, and capabilities. 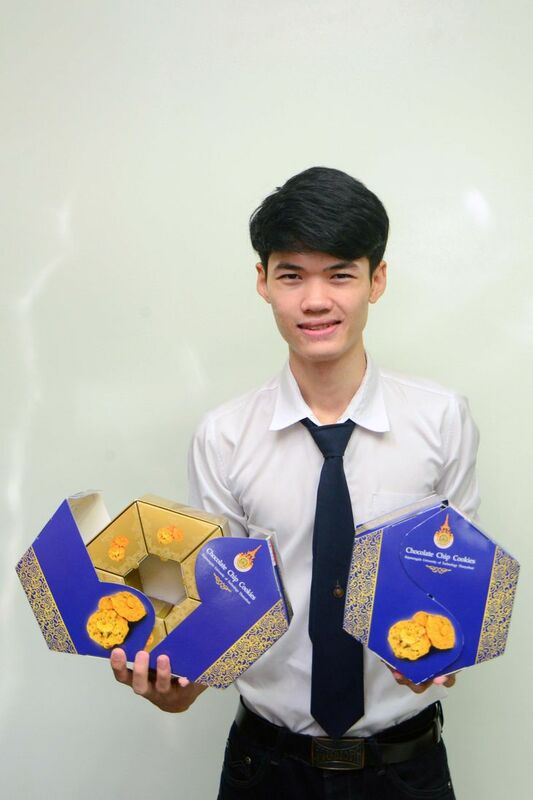 Professors and students from Faculty of Fine and Applied Arts, RMUTT, have been won 4 awards in this contest, Thai Star Packaging Award 2016. From the total of 496 packaging designs provided by students and company’s representors, our packaging design for glass blower products has been acquired award of packaging design for present market product. In the packaging prototype for distribution awards, our packaging for sandwich has been acquired 3rd prize award and packaging for cookie and ship model have been acquired honorable mention awards. Asst. 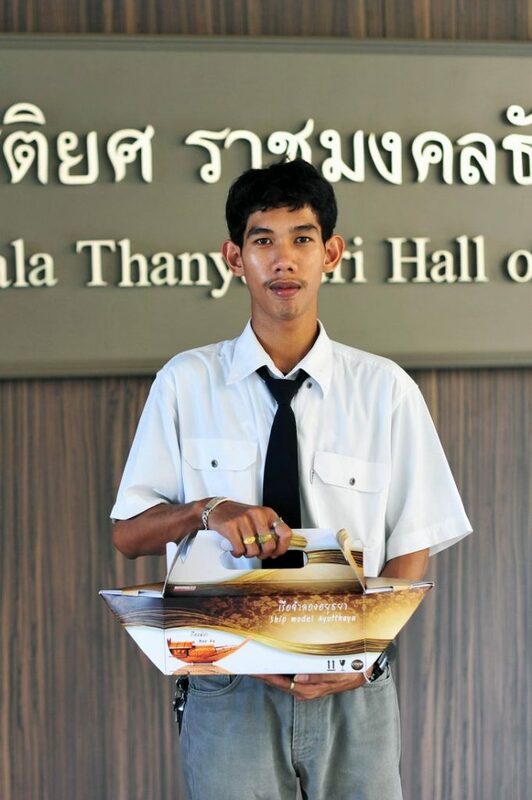 Juthamas Charoenpongmalai, the professor from Faculty of Fine and Applied Arts (RMUTT), has been received award of packaging design for present market product (a.k.a. packaging for distribution). 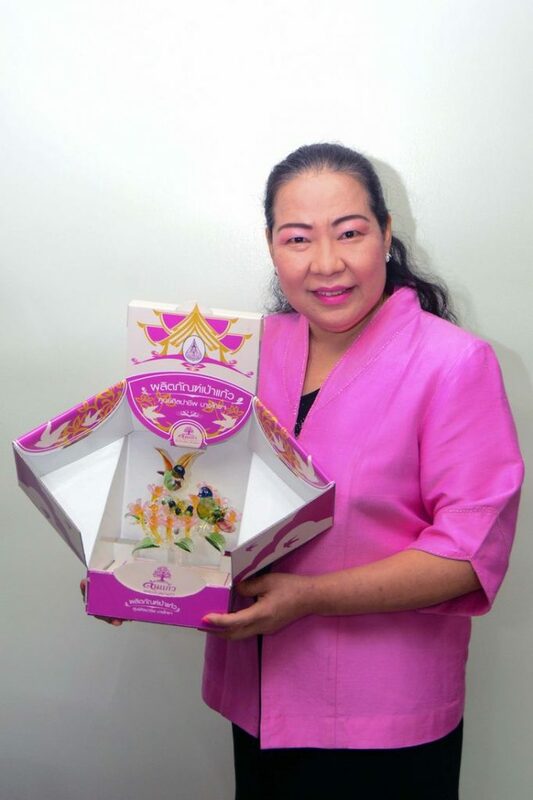 Her packaging design has been designed to contain glass blower products of Bang Sai Royal Folk Arts and Crafts Center, The Foundation for the Promotion of Supplementary Occupations and Related Technique of Her Majesty Queen Sirikit of Thailand. She based her packaging design on product showcase, eyes catching through consumer (distribution), and convenience for transportation. The component of her packaging design consisted of inner structure designing for holding and locking products. An outer square shape structure was designed for overlapping the packaging while transporting the products, folding while there were no products inside, and forming back to outer packaging without using any glues. While unbox the packaging, it will show out glass blower products inside. The shape of her packaging design looks like bird is spreading their wings. 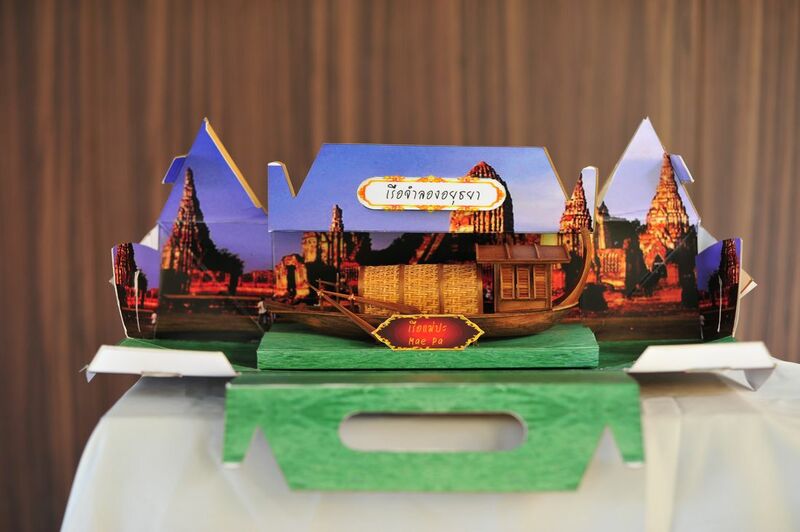 Structure is made from corrugated paper type E. The pattern on glass blower product has been designed to replicate Sala Phra Ming Kwan, Thai modern design building in Bang Sai Royal Folk Arts and Crafts Center. She uses “China box-tree” as her trademark and also applied on both glass blower’s side parts and back of the packaging box as well. Furthermore, her packaging design can be placed together and looked like continuous pattern. 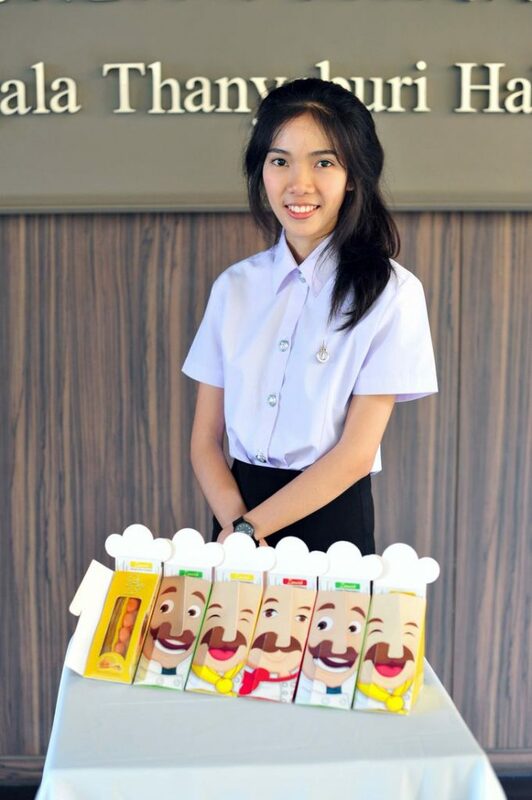 The packaging design for sandwich product, 3rd prize award in the packaging prototype for distribution, named “Zamwich” has been designed by Ms. Rattanaporn Aumphijit. She is the forth year’s student from the Faculty of Fine and Applied Arts, minor in product design. She shared that sandwich is the convenience food where everyone knows how to find and convenience to eat. Together with her inspiration from professional chef who has the ability to cook a delicious food while making others feel like they needed to have this, she brought and mixed this concept on her packaging design. She has been designed her packaging to replicate chef’s nationality, emotionality, and skin colors. When the consumer perceived her packaging design, they will feel like it made by professional chef in AEC. The packaging design for cookie has been designed by Mr. Suriya Srivarom and Ms. Rattanaporn Aumphijit. They are forth year’s students from product design department. They have been designed their packaging based on university’s needs which is packaging design for cookie. The concept was to use it as a gift for people in special or occasional day. 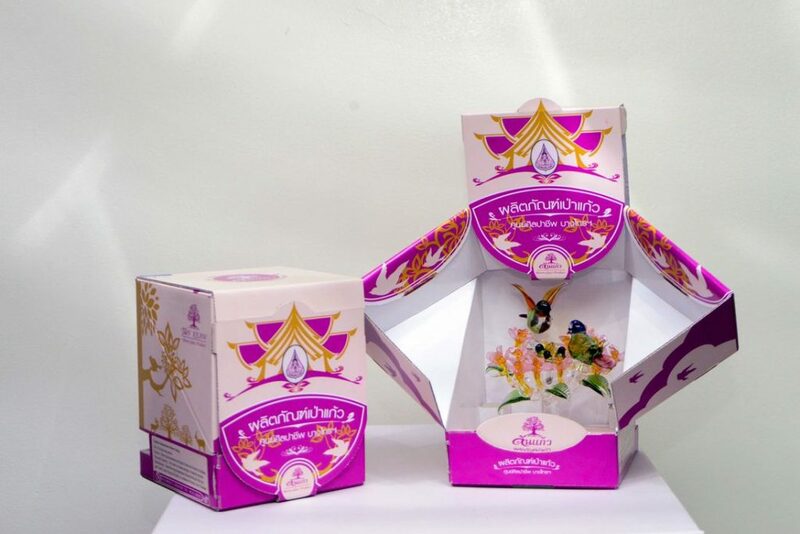 She has been designed her packaging with hexagon shape and implied flower blooming feel into her packaging product show. 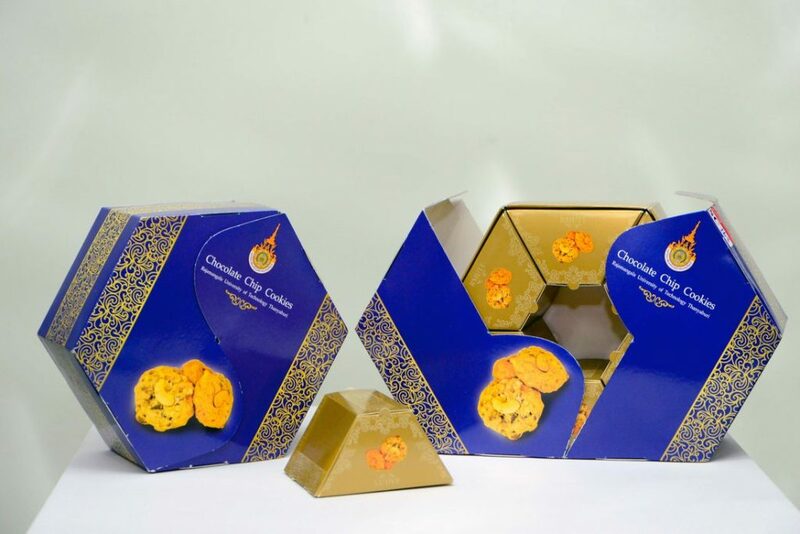 The packaging can contain up to 6 small cookie boxes. Outer structure was strong enough to protect inside products. Blue color has been used as a primary color to represent university. 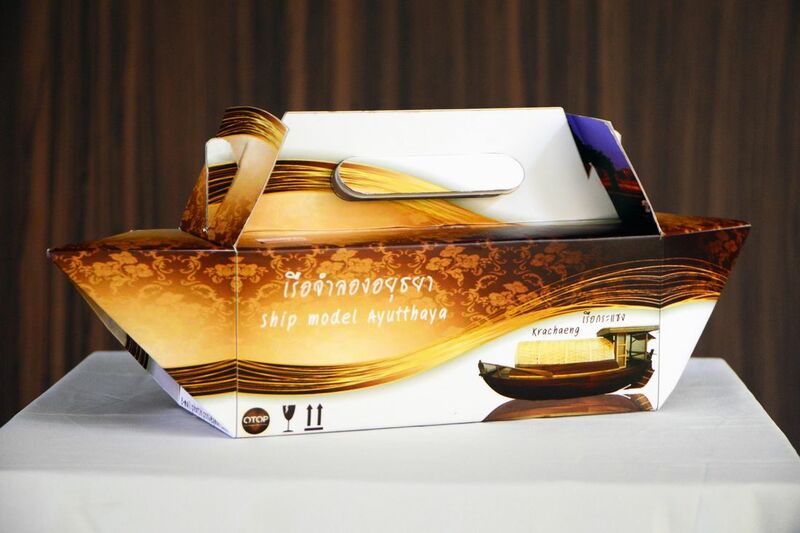 The packaging design for ship model has been designed by Mr. Pairote Rodchanarak, a third year’s student from product design department. He mentioned that he has passion in Thai culture and tradition. 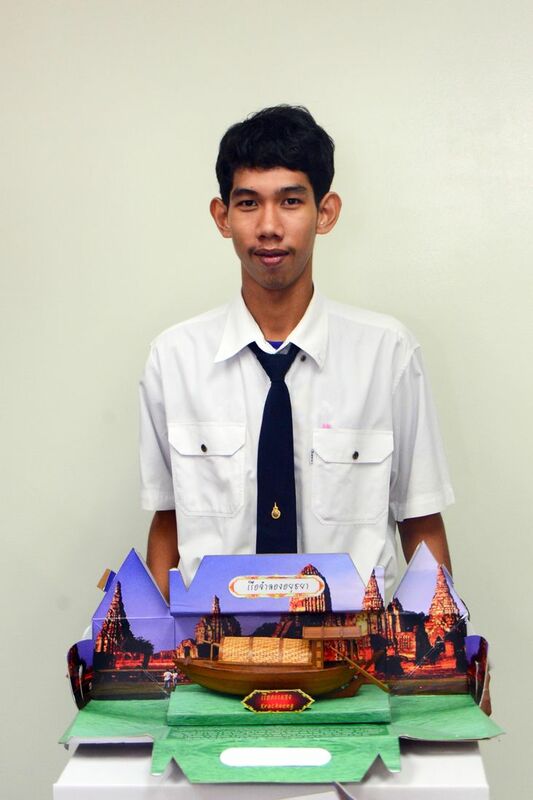 He has a chance to go to Ayutthaya province and fascinated in ship model. So he decided to design his packaging to contain that ship model. The packaging can be folded up and looks like ship. It can be used as an interesting packaging for souvenirs. Once it has been opened, there will be a story of Ayutthaya province provided inside. He also shared that he was so proud that he got the award from this competition.